From the North: Take I-5, I-405 or CA-73 (toll road) to CA-133 west/Laguna Canyon Road. The Festival of Arts will be on your right approximately three miles after passing El Toro Road. From the South: Take I-5 north and exit El Toro Road. Turn left onto Laguna Canyon Road. Three miles down the road, the Festival of Arts will be on your right. Because there are three art festivals going on simultaneously in Laguna Beach, we recommend that you arrive early and allow extra time for parking. For guests with disabilities and handicap parking information, visit our Accessibility page. Please note, there is no parking available directly at our facility. There are a very limited number of spots located directly in front of our box office for pick up/drop off. There are 8 public parking lots in the City of Laguna Beach, priced from $10-15 all day with slight increases on weekends and holidays. Visit Laguna Beach has detailed information on parking locations throughout the city. Located throughout town, including Laguna Canyon Road. $2-3 per hour for a 3 hour maximum in the downtown area. Most accept credit cards. Enforced daily 8am to 9pm. Meters are free with a handicap placard or license plate. There are a limited number of free parking spaces for buses on Laguna Canyon Rd just before the Festival entrance. If these are filled, drivers may drop passengers off, make a U-turn at the traffic light and proceed to Act V Parking Lot. Laguna Beach Transit offers free shuttle service to the Festival from locations along Pacific Coast Hwy and Laguna Canyon Rd. Shuttles run continuously from 9:30 am to 11:30 pm. The trolley frequency is every 20 minutes, but may vary depending on traffic conditions. For more information on the free weekend trolley, please call (949) 497-0766. 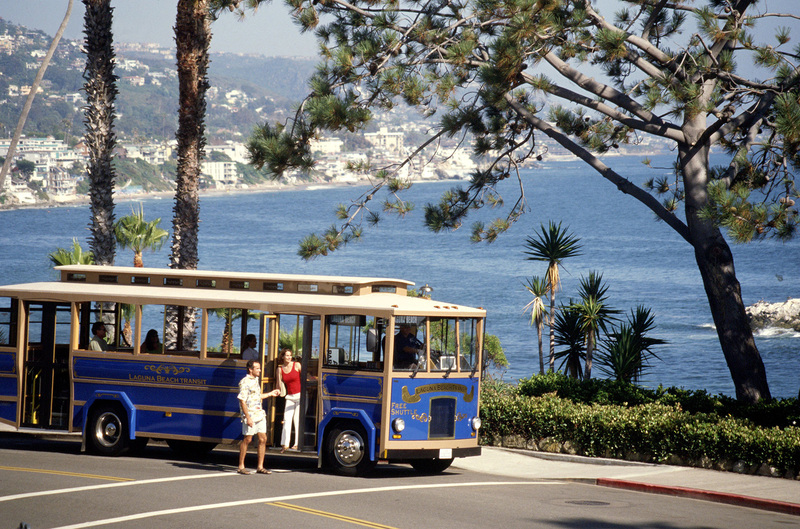 Download the Visit Laguna Beach app and use the “Trolley/Bus Tracker” function to see real-time locations of all of the trolleys. The Summer Breeze makes a loop beginning at the SR-133/I-405 parking lot and continues along Laguna Canyon Road with stops at the Sawdust Art Festival, Laguna Art-A-Fair, Festival of Arts, Pageant of the Masters, the Laguna Playhouse and the Laguna Beach Bus Station, where it meets the free Laguna Beach Trolley. To return to your car, just hop aboard at any of the Summer Breeze stops and ride back to the parking lot.